the second outfit is my fave because i generally don't wear sneakers but the first one hit me because of the leopard print and stripes combo!! Love the stripes/leopard combo with Chucks, but the second outfit is so simple it's perfect. And Cooper...what a sweet little face! I love the breton shirts so much. 1st look is lovely! I love it when people use stripes as a neutral. It looks great! first outfit the best!!! love red clutch and Converse!!! I'm so glad I found your blog - I love your style! Love the mix of prints and the bold red color! Hello to Cooper! I love the second look too--nice boots! Enjoy the rest of the weekend! cute scarf and love the red pants! A couple of perfect casual weekend outfits! Lovely. You always have the best bags! I really like both these casual looks on you! The red jeans are great and love with the matching bag. I also like the browns you have in outfit two, a long necklace would have worked but I like the simple look you went with! I like the effortlessness and neutral tone of your outfit, you look great! Love your Balenciaga clutch ! Stripes with red is one of my all time favourite combinations! Always looks fantastic. The second outfit is so classy and chic and for that reason I don't think it's missing anything!! 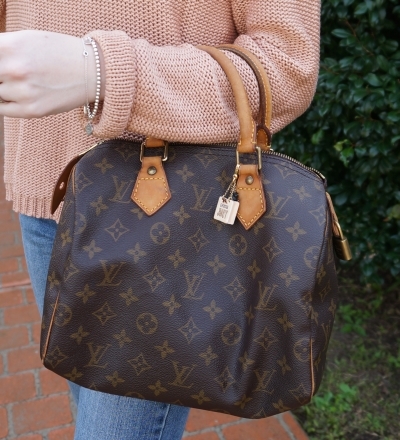 I'm in love with your vintage LV bag! Love the mix of prints in your first look ! Love the second look - you look great! 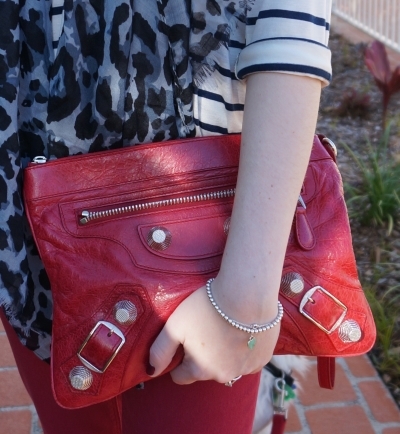 What an awesome red clutch–I love it's tough vibe! Cooper looks so handsome ! And you Mica, I must say look beautiful too - the stripe and animal print match is one of my favorites and your tall boot+sweater look is marvelous, so very model like. Looking great Mica! Who would have though that stripes and leopard could look so good together!?! I'll have to try that sometime! both outfits are cute! i love the red pants :) i just love a pop of color in an outfit. I really like both of these! The cozy neutral look makes me want fall to hurry up and get here. The blue/gray leopard print scarf is great! I wish it was cool enough here to wear it. We are having an upteinth heatwave! I love how you styled your red pants, they look amazing! And the second one is perfect for an everyday, love it! Hi Mica! You are looking so cute in both of these outfits! I love them, especially the second outfit... the neutral combination is just fantastic. Plus your purse is to die for :) Cooper is ADORABLE!!! what a cute puppy!! i love the red jeans and the mix of stripes and animal print is so chic! i'll have to try that sometime. Cotton On have some awesome stuff, loving that scarf, need to keep my eyes peeled for it! Love love the clutch, and Copper is SO cute. I love both looks! The stripes and both bags. You have some amazing bags! I need to save up for a goodnLV splurge soon. Thanks for linking up again! Mixing the stipes with the leopard is genius...but that clutch is really the show stopper!! Thanks again for linking up to Trend Spin, and make sure to come back next week for bows!! How cute! love the pattern mixture in the monotones with the colored pants on bottom. You have a great sense of style!! can't really go wrong with red / white / black - love that cooper has a matching leash!